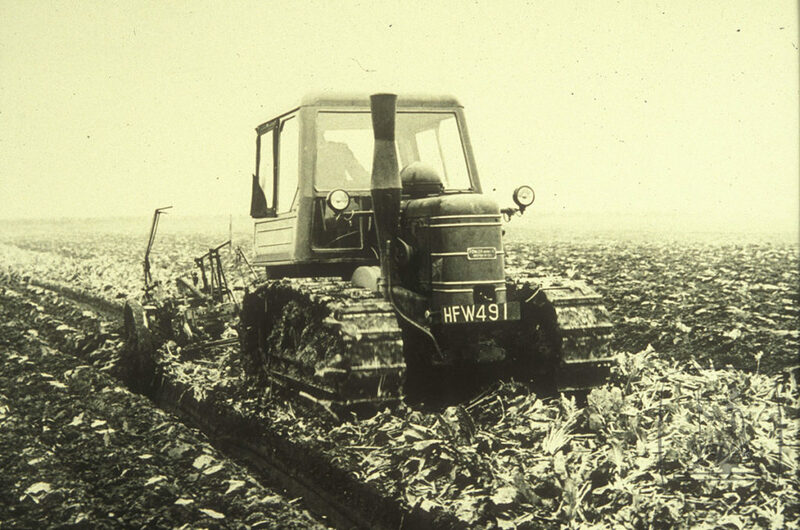 Both Marshalls and Fowlers had come together in the 1940s to create the single cylinder VF crawler tractor. From 1951 Fowlers produced the Challenger 1 crawler tractor which had a Marshall ED5 twin cylinder 2 stroke diesel engine. In 1954 the decision was made for a replacement for the Challenger 1. It was agreed that it would not be profitable to provide an ‘in –house’ power unit for the new tractor. The choice of the new out sourced engine was the 48hp Perkins L4 four cylinder diesel. Most of the development was carried out at Gainsborough and the new “Track Marshall” made its debut appearance in 1955 at the Royal Show. New models were continuously developed for agriculture and industry up until 1975 when Thomas Ward sold Marshall-Fowler to British Leyland. Leyland’s initial funding provided capital for further development. The “Track Marshall” name was replaced with the “Aveling Marshall” badge. Aveling Marshall mainly concentrated on the high horsepower sector and produced their first model with single lever control power assisted steering. In late 1979 Aveling-Marshall was put up for sale. This time wealthy local farmer Charles Nickerson stepped in to save the company. In 1982 Nickerson bought the Leyland wheeled tractor division and brought the production back to Gainsborough. As a result of heavy losses amounting to £12.5 million Marshalls were once again put into receivership in 1986. Ex Sales Director Hubert Flatters bought the company in 1986. He realised that there was a need to rekindle lost alliances with overseas customers. The company had been turned around, but his untimely death in 1987 put pressure on his family and the company was sold again to the TWR group in 1990. New funds permitted the continuation of current models. Development of a new revolutionary crawler with rubber tracks was undertaken, however demand was disappointing and with mounting debts it was no longer buoyant. Eventually in 1998 the business was sold to Tony Leighton. Tractor production ceased and the new company concentrated on the provision of spare parts.